There has never been a better time to choose glass as the key design component in achieving your perfect home environment or workspace. Through our use of glass, here at Glass Design & Build London we can enhance the two elements which often inspire people the most – the interplay of light within a building, and the view looking out from it. Through a combination of design, technology and engineering, we are at the forefront of achieving effects of light, space and vista that just a few years ago would have seemed impossible. It’s the use of glass which creates a reaction from our clients like no other: “A work of art”; “We can’t stop looking at the views – WOW!” It may be science that’s the source these effects, but we like to think we turn this into art. Dear old England, how often is it grey and overcast? As a result, over the years, for our clients across the UK, we have found clever ways to let into a building the maximum amount of natural light. Using the latest developments in glass technology, we utilise the exceptional strength and stunning level of clarity available in structural glass. We use this to create buildings and building extensions which seem weightless, airy and are filled with light, and yet have the security, insulation and strength equal or greater than using more traditional building materials. 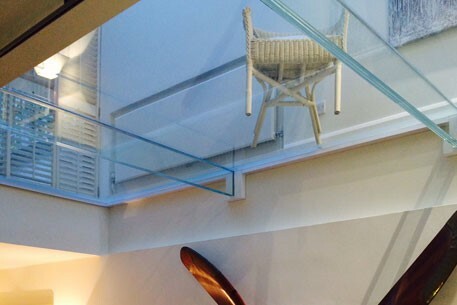 Our structural glass is manufactured using a method that increases its strength by up to 7 times, making it suitable for applications such as flooring, staircases, frameless glass systems and even glass beams. So, let your imagination run wild. Think of all the light you’d like, and then some. Can you have too much light? We can help to control it too, by adding texture and colour to glass, to suit the room and the direction of sunlight. The choice is yours – coloured back-painting of glass, frosting and etching, screen printing and even acid etching through to laminated silk and gold foil mesh to create the ultimate interior design finish. As well as all that light, glass of course also lets in… the view from your property. If the key to desirability and value is location, location, location, then it’s likely that your view has played a part in your choice of home or workspace. Whether it’s simply the back garden, or the view beyond, to countryside, coastline or cityscape, an inspiring view can transform your living space and your interaction with the outside. To our design team, this is often 50% of the consideration when coming up with a solution for you: as well as the living space itself, how best to maximise the enjoyment of your surroundings? Think of our use of glass like a great landscape photograph – it frames and enhances the view, creating perspective and context. 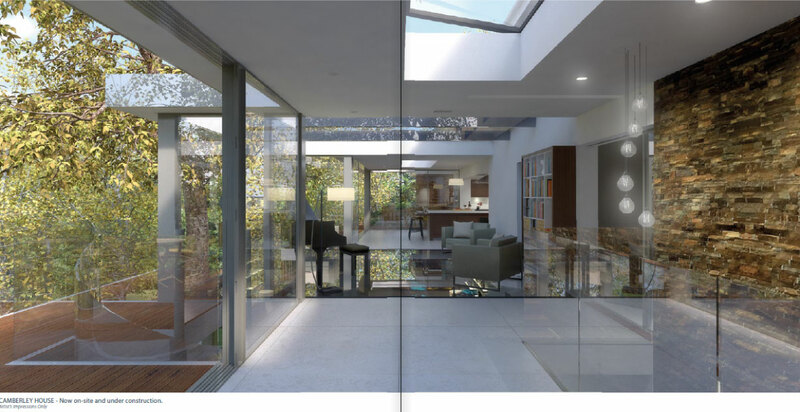 As we tour your property (if enhancing or extending an existing building) or take a virtual tour through the plans for a new one, we do so with the equivalent of a film director’s eye – always framing each shot, seeing the potential for the long view as well as the close-up. To get even closer to that outside view, we can create the perfect gateway to the outside. 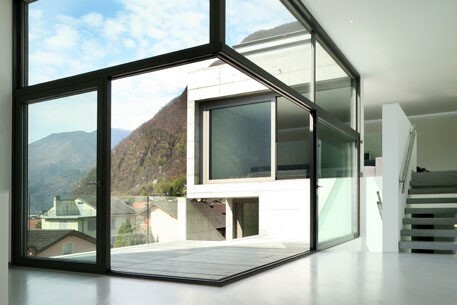 We offer large sliding glass doors in a multitude of materials and finishes, in configurations to suit every need: automatic doors; single and multi-sliding doors; pivot doors; oversized doors; and possibly our favourite right now, bi-parting door systems, which create a corner-based opening, see the picture below. On our site you can see our full range of door systems. Strong on security:All our glass, locks and fittings meet the highest standards of security, ensuring that glass is never the weak-spot in your property. Strong on privacy: With double, triple and even quadruple-glazing available, we can build in impressive levels of acoustic damping, so that again, from a sound and noise point of view, glass is never a weak-spot. Also, our design team can incorporate all kinds of blinds and screening options if required. Strong on temperature control: Glass of course presents a challenge in both directions – keeping the temperature down when sunny and retaining heat in the cold. 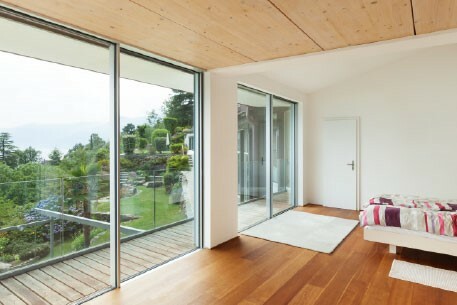 This is always an important part of our design recommendations – where appropriate, we use low-e coated glass which reflects the heat back into your room; and incorporate ways to control the heat from the sun. Many of our most satisfying projects are property extensions. These of course create more space but also enhance the WHOLE property and create that more seamless link to your outside space. The kitchen is now so often at the heart of your day-to-day living, with the traditional space allotted to this within your property quite possibly outgrown. 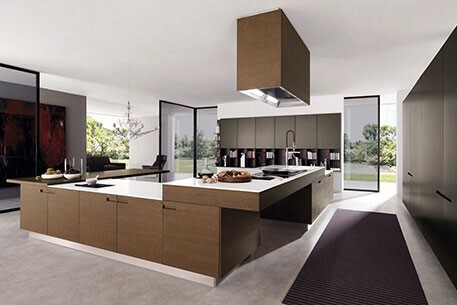 With our expertise in glass, our kitchen designs give you an ultra-contemporary space, with the focus on practicality, flexibility, space and light. See more information on our Extension service. Here at Glass Design & Build London, we have a great track-record in handling projects which could comfortably be called Grand Designs, but we also give the same care and attention to detail to small-scale works too. So, whatever the size and scale of your idea, we’d love to get involved. Using our specialist design consultation and survey service, we can guide you through the whole process. We can help you to visual your initial idea; come up with a plan and a budget; and then (as our customers keep telling us), exceed your expectations with the final result. You can find out more about our design service and send us your initial enquiry here. To see how glass can inspire YOU, call us on 0207 074 8989.